[em-uh-ser-ee] Anatomy. Sending or coming out, as certain veins that pass through the skull and connect the venous sinuses inside with the veins outside. Built from the ground up, Walrus Audio has developed a 2-in-1 boost to help make leads stand out, slides sing, finger picking come to life and to push tube amps into great natural breakup. Like the veins its named after, the Emissary Parallel Boost features two independent boost circuits running in parallel to work together to help give your tone a real “sinus clearing experience”. Use one or the other by itself, or mix any combination of both by turning up each knob to the desired level. The top knob controls the volume for the “bright” boost circuit. This is a clean, high headroom JFET boost, with a slight emphasis on higher frequencies to liven up your tone. The bottom knob controls the volume for the “mid” boost circuit. This circuit features a targeted boost at either 1kHz or 800Hz selected by the toggle switch. The bypass switch also features a momentary function. When the bypass switch is in off position, press and hold to temporarily activate the effect. Releasing the switch turns the effect off. 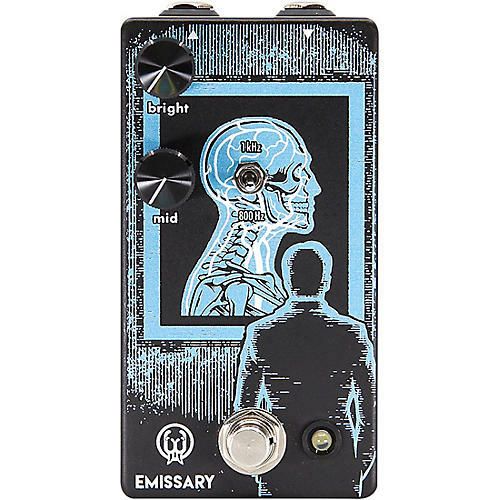 The Emissary comes in a “Silk Satin Black” finish with light blue and white ink. Artwork by illustrator Adam Forster features an x-ray of a patients skull viewing the Emissary and other vital veins running through the head. The use of an isolated power supply is recommended for powering all Walrus Audio Pedals. Daisy chain power supplies are not recommended.